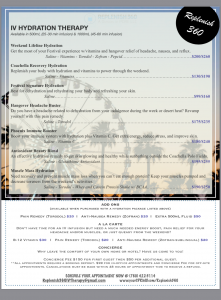 In preparation for Splash House 2018 on August 10th to the 20th at The Renaissance Hotel, The Riviera Hotel, and The Saguaro Hotel in Palm Springs, California, Replenish 360’s Intravenous (IV) Hydration Therapy is paving the way for your top-tier and high quality professional “replenishment of your mind and body, restoring you to your best self, and improving your health and everyday performance” throughout these festive moments when you need a little pick me up in your hydration and wellness needs as you enjoy Goldenvoice’s presentation of your favorite lineups of music superstars – such as Gorgon City, Gryffin DJ Set, Louise The Child, The Black Madonna, Fisher, and Mija – and the upcoming popular artists for both the 2018 weekends of Splash House. We not only offer Special Music Festival Hydrations and Discounts (such as our Festival Season Infusions, Add Ons, A La Carte Services, Group and Individual Concierge Services, Special Events, and Membership Options) and one of the most affordable individual and group/party intravenous and oral fluid hydration therapy but we can provide you with vibrant energy and fuel for the maintenance of your party-going stamina, muscle rebound and pain relief for your muscle aches and mild headache, anti-nauseating and indigestion remedies for your hangover cure, sharper focus for better enjoyment with your Splash House friends and family, immune support for the prevention of illnesses while you’re on vacation with our one-of-a-kind IV infusions, vitamin and antioxidant supplementation, micronutrient therapy, and other additional supplementary wellness services, such as massage therapy and esthetician and cleansing amenities for instance. After purchasing your sought after and already sold-out Splash House passes at Goldenvoice, StubHub, Ticketmaster, or private ticket vendors and merchants; staking out your lodgings; preparing for your sustenance and pick-me-up beverages at the local grocery stores; and finding your shuttle routes or Uber traveling service to and from the booked hotel room or rented Airbnb house, villas, and vacation homes in the Palm Springs to Indio area, don’t forget to book your year-round and local appointments for Replenish 360’s IV Hydration Menu and Packages, Assorted A La Carte Wellness Cocktails, Wellness Service Memberships, and Massage Therapy to enhance your experience at Splash House! In-house infusions are available only at our in-facility and off-site posts near you during this Festival Season. Get the most of your Festival experience with vitamins and hangover relief of headache, nausea, and reflux. We can offer you our new-revamped Weekend Lifeline Hydration, which includes 500 ml IV hydration (25-30 min. infusion) with vitamins along with analgesic/pain, nausea, and indigestion remedy. $200. Our full-sized Weekend Lifeline Hydration that is a 1000 ml IV drip (45-60 min infusion) with vitamins along with analgesic/pain, nausea, and indigestion remedy is also available for you to choose from for your hydration and wellness needs. $260. For more sustained hydration, energy and get the most of your Festival Season experience, vacation and good-times, try our Coachella Recovery Hydration that is a 500 ml IV drip (25-30 min. infusion) with vitamins. $130. Our full-sized Coachella Recovery Hydration that is a 1000 ml IV drip (45-60 min infusion) with vitamins is also available for you to choose from for your hydration and wellness needs. $190. To save money, you can also try our new half-size Festival Signature Hydration that is a 500 ml IV drip (25-30 min infusion) that gives you more bang for your buck in less time for an IV drip for those guests tagging along for some affordable hydrations. $99. Of course, our full-sized Festival Signature Hydration that is a 500 ml IV drip (45-60 min infusion) is also available for you to choose from for your hydration and wellness needs. $160. Our full-sized Hangover Headache Buster that is a 1000 ml IV drip (45-60 min infusion) with analgesic pain remedy is also available for you to choose from for your hydration and wellness needs. $235. Are you’re feeling like you’re getting a little sick this Festival Season? Why not have our new-revamped Phoenix Immune Booster that includes 500 ml IV drip (25-30 min. infusion) with Vitamin C. $180. Our full-sized Phoenix Immune Booster that is a 1000 ml IV drip (45-60 min infusion) with vitamins along with Vitamin C is also available for you to choose from for your hydration and wellness needs. $240. 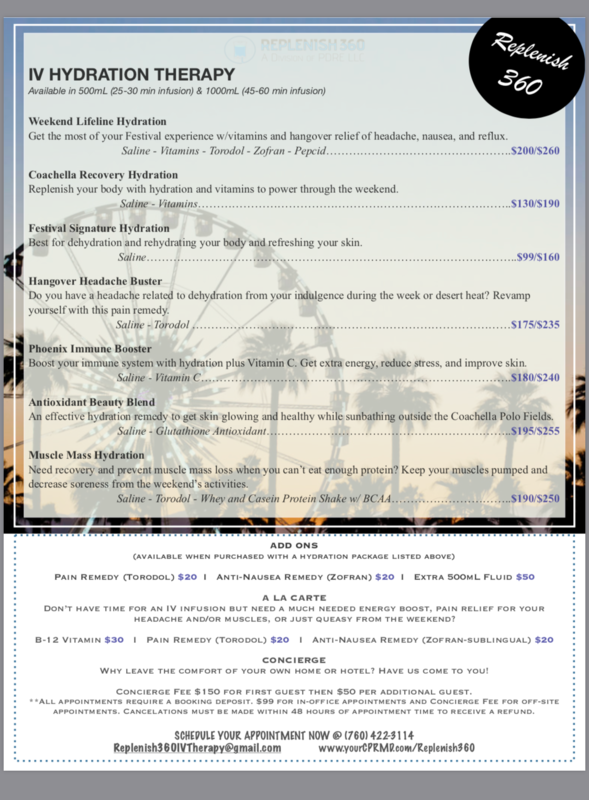 Want an effective hydration remedy to get your skin glowing and healthy while sunbathing outside the Coachella Polo Fields? Well, try our new-revamped Antioxidant Beauty Blend that is a 500 ml IV skin rejuvenating therapy (25-30 min. infusion) with Glutathione Antioxidant. $195. Want recovery and prevent muscle mass lost when you can’t eat enough protein? Try our new-revamped Muscle Mass Hydration, which includes our Signature Hydration 500 ml IV Therapy (25-30 min. infusion) with analgesic pain remedy and then sip on a whey and casein protein shake with branched-chain amino acids (BCAA) to keep your muscle pumps and decrease soreness from the weekend’s activities. $190. Why leave the comfort of your own home or hotel? Have us come to you! We do have special rates for those looking for a Group Concierge Services. Prepaid and Pre-booked for Four (4) or More Guests: Waive Your Concierge Fee! Note: There is a 15% gratuity charge for all concierge and off-site services. If you are a one-party visitor you can take advantage of our individual concierge services. Personalized Hydration 1000 ml IV Therapy with vitamins and a blend of nausea, pain, or indigestion remedies (45-60 min) option during our normal business hours from 9:00 am to 6:00 pm. $360. After Hours Hydration 1000 ml IV Therapy with vitamins and a blend of nausea, pain, or indigestion remedies (45-60 min) option after 6:00 pm and into the wee hours of your night or morning. $450. We would need a pre-booking non-refundable deposit for our services to officially schedule our IV Hydration Therapy sessions. All appointments require a booking deposit for in-office and off-site services. Prepaid and Pre-booked for Ten (10) or More Guests: Waive Your Concierge Fee! Registration cancellations more than 48 hours from start of a service/appointment will receive a 100% refund, minus a $25 administrative fee per scheduled guests, clients, and customers. Cancellations must be made within 48 hours of appointment time to receive a refund. No refunds will be issued for cancellations 48 hours or less prior to the service/appointment. However, such guests, clients, and customers may attend a future service/appointment by paying a $35 rescheduling fee. Once the service/appointment has begun or been rescheduled, no refunds will be given unless otherwise stated or agreed upon. Meanwhile, you can take a look at our Wellness Menus at your own convenience and tell us which in-house or off-site concierge Replenish 360 IV hydration amenities you want to activate. We will gladly inform our staff RNs and medical team who are on duty to provide you with our one-of-a-kind and VIP IV vitamin drip during the weekday and weekend that you are in town for the Coachella, Splash House, and the rest of the Festival Season! 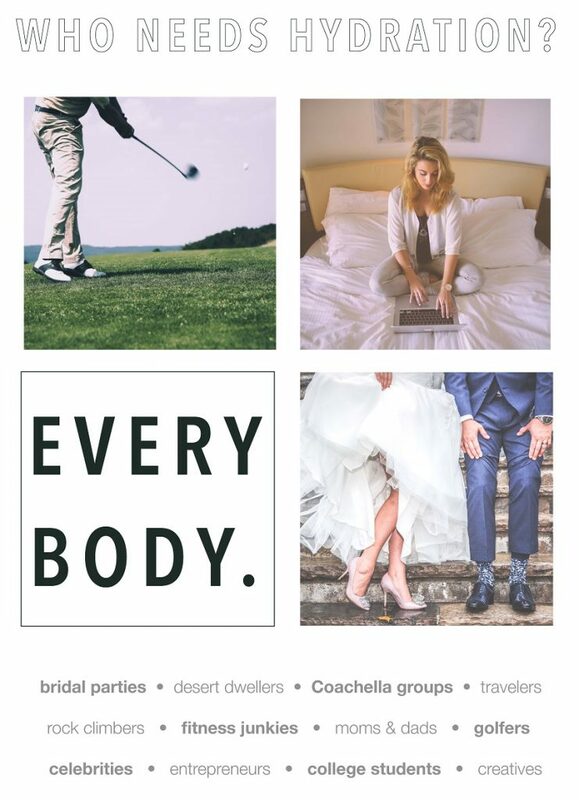 around the city of PALM SPRINGS? IV Hydration Services to the following Palm Springs area cities.